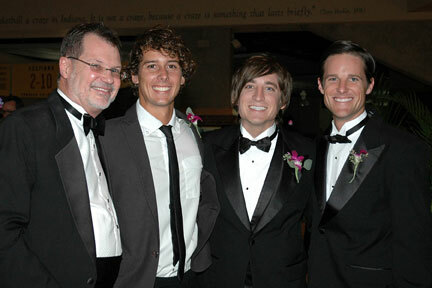 (Photo left) Heartland Truly Moving Pictures President and CEO Jeff Sparks (left) along with Laren Poole, Bobby Bailey and Jason Russell, the 2007 Heartland Pioneering Spirit Award honorees. Indianapolis, IN (October 29, 2007)  The 16th annual Heartland Film Festival® concluded its nine-day run on Friday, October 26 with the announcement of the 2007 Audience Choice Award winners and two sold-out screenings of “The Kite Runner” with Screenwriter David Benioff in attendance. The 2007 Festival was a success as more than 22,000 people attended events and saw films that bring out the best in the human spirit as well as met the filmmakers and stars that made them. The Festival kicked off in Hollywood style on Thursday, October 18 with a sold-out, premiere event featuring “August Rush” by Warner Bros. Pictures. Producer Richard Barton Lewis and Music Supervisor Anastasia Brown greeted fans on the red carpet and accepted a Heartland Truly Moving Picture Award for the film. The festivities continued on Friday evening as 16 Crystal Heart Award-winning films opened at three Indianapolis venues. These films were selected from 619 international submissions for demonstrating artistic and technical merit and for best meeting Heartland’s mission. 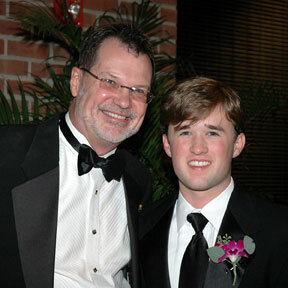 (Photo left) Heartland Truly Moving Pictures President and CEO Jeff Sparks along with Haley Joel Osment. Indianapolis-native and award-winning correspondent Carlos Diaz from “Extra” emceed the Festival’s annual black tie awards gala where Heartland presented Crystal Heart Awards and $200,000 in cash prizes to filmmakers for their role in creating enriching and inspiring films. Special guests Haley Joel Osment ("Home of the Giants," "Pay It Forward"), Lisa Guerrero ("Inside Edition" correspondent, Producer and actor in "A Plumm Summer"), Angelo Pizzo ("Hoosiers," "Rudy") and Judy Stewart (The Stewart Foundation) presented the awards. The $100,000 Grand Prize Award for Best Dramatic Feature was presented to “Bella.” Producer/ Director/Writer Alejandro Monteverde accepted the award. Heartland’s grand prize award was doubled to $100,000 in 2006 and is underwritten by the Max Simon Charitable Foundation. All award-winning dramatic feature films are eligible to receive this award, which is one of the largest single cash prizes awarded by a film festival. The $25,000 Award for Best Documentary Feature was given to Producer/Director/Writer Irene Taylor Brodsky for “Hear and Now.” All award-winning documentary feature films are eligible to receive this award, which is sponsored by Bright Ideas in Broad Ripple and The Godby Family Foundation. Producer/Director/Writer Kurt Kuenne received the $10,000 Vision Award for Best Short Film for “Validation.” Sponsored by Vision Racing, all awarding-winning shorts are eligible to receive this award. Bobby Bailey, Laren Poole and Jason Russell ("Invisible Children: Rough Cut") received the Pioneering Spirit Award for their innovative and creative spirit in filmmaking as well as for their ability to understand the power of film and how it can make a difference in people’s lives. Additional Festival activities included a premiere screening of “A Plumm Summer” with actors Chris J. Kelly (Elliot Plumm), Owen Pearce (Rocky Plumm), Lisa Guerrero (Roxie Plumm and Producer), Morgan Flynn (Haley Dubois) and Producer/Director/Writer Caroline Zelder at the always-popular Family Movie Event; an exclusive peek at clips from upcoming Walt Disney Pictures’ films with Mark Zoradi, President of Walt Disney Studios Motion Pictures Group; and special screenings of “Invisible Children: Rough Cut” and “Renewing American Culture: The Pursuit of Happiness.” Aspiring filmmakers participated in Heartland’s expanded two-day educational seminar. The event featured industry experts Sterling Van Wagenen and David Weiss, Heartland Pioneering Spirit Award honorees Bobby Bailey, Laren Poole and Jason Russell along with several 2007 award-winning filmmakers as they shared knowledge and advice on the independent filmmaking process. Audience Choice Award for Dramatic Feature: “Man In the Chair” produced, directed and written by Michael Schroeder. Audience Choice Award for Documentary Feature: “Hear and Now” produced, directed and written by Irene Taylor Brodsky. Audience Choice Award for Short Film: “Validation” produced, directed and written by Kurt Kuenne.